When reporters decided that they would cover politics more than anything else, everything else went unnoticed but we were actually looking out for veterans. So, dear readers, here are veterans reports in other news! Vietnam veteran was fired as Dean of military school. Why? He used cannabis for cancer. Missing since Pearl Harbor Sailor's remains were identified as Harold Lloyd Head. Widow of Sgt. Richard Kutch, will run the Marine Marathon to honor her husband. He committed suicide five years ago. Army veteran Tyler Lackey was murdered at an ATM two years ago. Man was just convicted of it. Navy veteran's puppies were stolen from his home. He is disabled. Veteran reacted to the latest VA budget, sold by reporters as the largest in history, but did not mention that most of that increase goes to private providers and not into the VA. Volunteers helped a Vietnam veteran who has been living out of his car. Why? His house was ruined by Hurricane Harvey. Yes, that long ago. Two soldiers in Alaska were hunting when a bear dropped on them from a ridge after being shot. One of them has "life threatening injuries." Lt. Col. Patrick Schreiber's adopted daughter is being deported. Why? 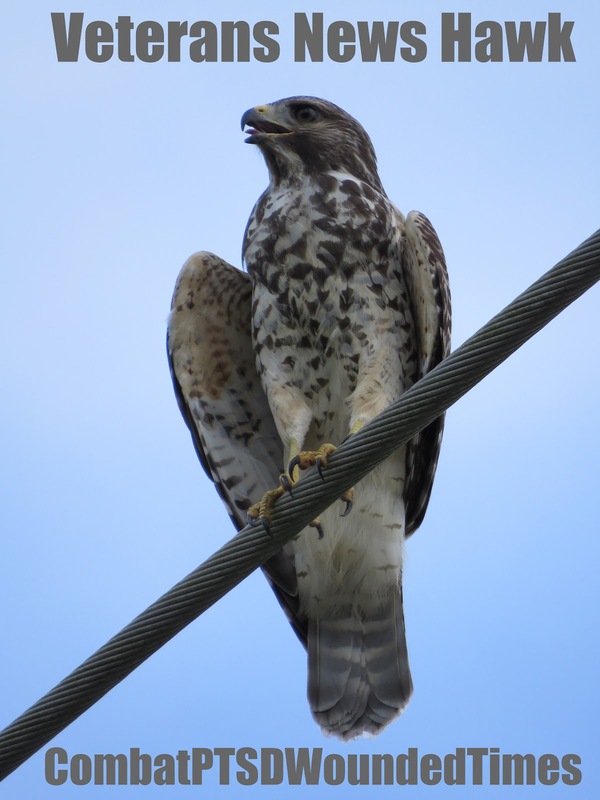 He did not fill out the papers in time. He was deployed. VA Secretary Robert Wilkie went to check the damage done to VA facilities by Hurricane Florence. A headline that has been about Staff Sgt. Ronald Shurer II, receiving the Medal of Honor, should have mentioned that he is also dying of stage 4 lung cancer and has set up a GoFundMe for his family. Oh, by the way, he has also been serving in the Secret Service for President Trump. There are a lot more but those are just from today on Google+. 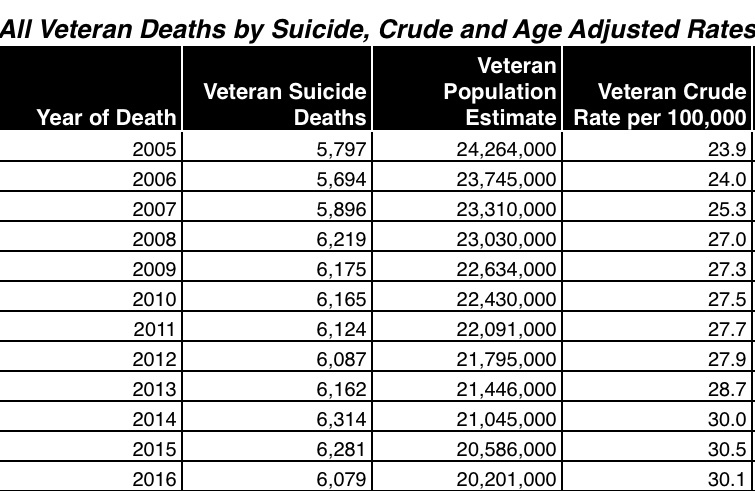 Then again, considering they are also reporting on veterans committing suicide, missing several keys points, here are a few of those too. 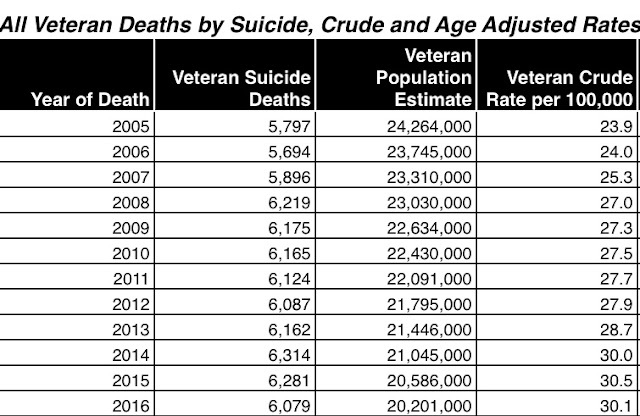 Veteran suicides have increased, not decreased. The number of living veterans has decreased since 2005 but clearly this chart shows the bigger picture. But reporters do not seem to mention any of this, other than a few who actually care. You can also check to see how your state did with all the "raising awareness" campaigns going on, and on, and on.